If you have more than one child, you’ve had to help your children learn to share. Most household sharing problems start when one child decides he wants something another child has – now. Both children in this situation need to be instructed. One needs to learn to be content. The other needs to learn to share. Let’s focus on the first child today. It may sound harsh, talking about a little one-year-old coveting. He doesn’t necessarily understand that the thing he wants is not his to take. He just sees it and wants it. Although we may need to teach the older sibling to be kind and to share with his little brother, the younger one also needs to learn that he cannot have what he wants whenever he wants it. He needs to learn to respect the rights and feelings of others. Start by defining “no-no’s” in the home, and faithfully discipline children when they challenge the limits you’ve set. Little ones will then be better prepared when you tell them “no” as they start grasping for another child’s plaything. They will also be trained to accept “no” as a final answer if the toy they are wanting is not one they may have. Teach children to say or sign the word “please” when they want something. Babies younger than a year old can be taught to say “please” with sign language at the meal table. If you don’t know official sign language, do some research or simply make up your own simple gesture. Help them use it each time they are asking for something, until they can sign it on their own. This will not only bring peace to your meal times, but will help little ones understand that they must ask for something, rather than demanding it. If they learn to do this, they will then be ready to politely say (or sign) “please” when you train them to ask another child for a turn with something, instead of fussing, grabbing, and making demands. Teach them to wait. As babies matures, they can be taught to wait without fussing. They can quietly busy themselves while they wait for you to finish cleaning the kitchen before you read them a story. They can wait until you pray at the table before starting to eat. If little ones have already practiced waiting for other things, they will be better prepared to wait for a turn with a desired toy, if one has been granted. With these practices in place, we can then take advantage of training opportunities as they arise. When the one-year-old starts pulling on the book his bigger brother is looking at, we can get his attention and tell him “no,” or explain that he needs to wait. 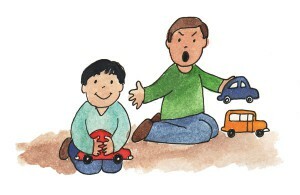 We can help him learn to ask politely by saying “please.” We can encourage him to play contentedly with other toys. And we can move on to discipline him if he fusses and resists our attempts to train him. Wisdom is required here to discern if a little one is simply not understanding what is asked of him, or if he is willfully resisting our instruction. Pray for the wisdom that God promises to give (James 1:5). As a child continues to grow he can be instructed with Scripture. David, in Psalm 119:36 prays, “Incline my heart to your testimonies,and not to selfish gain!” (ESV). We can point our children to Scripture as we seek to turn their hearts from covetousness, quietly explaining what what God says about their attitudes and actions. A two-year-old understands far more than we often believe he does. Simply have him repeat after you, “Thou shalt not covet” (Ex. 20:17), or “Outdo one another in showing honor” (Rom. 12:10, ESV), or “Be content with what you have” (Heb. 13:5, ESV) while you give him further instruction on how to politely ask for a turn, how to accept “no” as an answer without pouting, and how to wait patiently for his turn. “Better is a handful of quietness than two hands full of toil and a striving after wind” (Eccles. 4:6, ESV). This verse has great object lesson potential. Go out and have your child try to catch some wind in his hand! “Keep your life free from love of money, and be content with what you have, for he has said, “I will never leave you nor forsake you” (Heb 13:5, ESV). Point him to God as his true source of contentment. “Now there is great gain in godliness with contentment, for we brought nothing into the world, and we cannot take anything out of the world. But if we have food and clothing, with these we will be content” (1 Tim 6:6-8, ESV). Ask your child if he has food and clothes. Remind him that God says he should be content if he has these necessities. He can be happy, even if he doesn’t get to play with the toy he wants.